FY2017 passive income from S-REITs. Time flies and 2017 is coming to an end. Time for me to take a look at how much income my portfolio of S-REIT has generated for me in the final quarter of the year. The plan for Saizen REIT to transform into a REIT holding Australian industrial properties failed to materialise. In the end, it was delisted from the stock exchange and whatever residual value was distributed to its shareholders. This lifted my total income from S-REITs for the year rather nicely. Of course, this is definitely the final distribution from Saizen REIT and it will not be repeated. Did I change anything in my S-REITs portfolio in 4Q 2017? I decided to use some of the income received in 4Q 2017 to increase my investment in Starhill Global REIT by more than 50%, paying 74.5c a unit. This price is, of course, slightly higher than my initial purchase but I believe that even at 74.5c a unit, the REIT is still relatively undervalued. 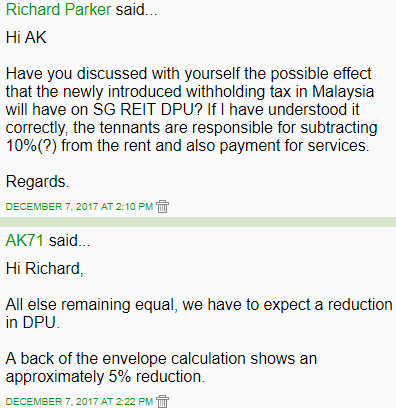 In my blog published in March 2017 (see related post #1 at the end of this blog), I said that I was knocking off 5% from the REIT's DPU to be conservative but I did not expect it to take a knock in this manner. So, everything else being equal, DPU could eventually be 4.75c. This would give me a distribution yield of 6.37%. If we would like to remain conservative and knock another 5% off its DPU, it would give us a DPU of 4.5c or a distribution yield of slightly more than 6%. Being a slightly less compelling offer now, I merely nibbled. Other than this minor addition, my portfolio of S-REITs is unchanged from the previous quarter. That works out to be approximately S$7,928.00 a month in passive income. Without a leg up from Saizen REIT's final contribution, I expect my passive income from S-REITs to be some 10% lower in 2018, everything else being equal. My next few blogs will be about my FY 2017 income from non-REITs and what I did in that space. Read a message from AK as ASSI turns 8: HERE. FY2017 passive income from non-REITs (Part 1): HERE. 1. Starhill Global REIT analysis. 2. Saizen REIT's bumper distribution. Merry Christmas & Happy 2018 AK! May all good things head your way! Thank you for your selfless sharing & dedication of so much time to your blog in order to talk to yourself. Thanks very much for the kind wishes. Merry Christmas and a Happy New year 2018..
thank you for constantly talking to yourself and we on the side reading and learning..
Hi Ak, thanks for sharing and inspiring us that it is possible to build up a passive income through prudent saving habits and investing. Your blog inspire me and have slowly building my dividend machine. My CPF and SRS have also done well. many thanks AK. Wishing you a happy new year, may 2018 filled with happiness, prosperity and good health. Starhill DPU has been declining when we compare the quarter with the previous year's quarter - is that cause for concern? Starhill Global REIT (SGREIT) reported another challenging set of results although this was in-line with our expectations. 2QFY18 DPU came in lower by 7.1% YoY to 1.17 S cents due to lower NPI and higher withholding taxes for its Malaysia and Australia properties. However, we expect 2HFY18 to be better for SGREIT as compared to 1HFY18 due to the commencement of its Singapore office leases which were committed in 2QFY18 and contribution from its China property. Another positive development was the announcement that global apparel retailer UNIQLO would be opening its first Perth flagship store in mid-2018 at SGREIT’s Plaza Arcade property. In terms of balance sheet, SGREIT’s gearing was stable at 35.3%, as at 31 Dec 2017, leaving SGREIT with a debt headroom of ~S$259m before reaching a gearing level of 40%. I remember reading your blog on starhill Reits. And you had started accumulating them during the price drop. I notice starhill reits is currently trading at around 0.68 cents. P/b ratio around 0.7. Can you talk to yourself on whether it is good time to accumulate some for the Long term? And whether the reits manager is able to turn the reits around?